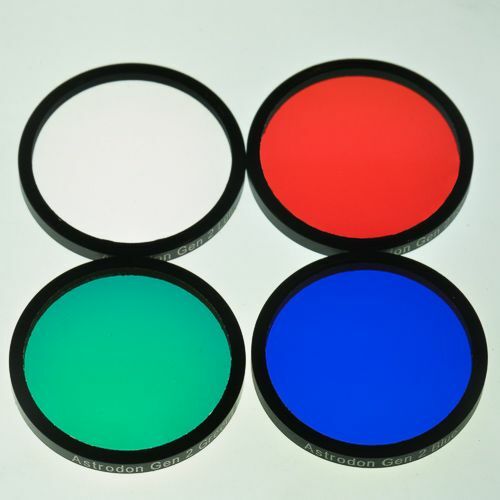 Astrodon Generation 2 (Gen2) Tru-Balance RGB filters have revolutionized CCD imaging. 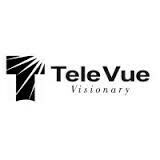 Their popularity is due to their ease-of-use, high optical throughput and great resulting colors for galaxies, star clusters and nebulae. There are two varieties of Tru-Balance filters- E-Series and I-Series. The E-Series filters were designed for cameras containing the full-frame KAF8300, KAF3200, KAF6303, KAF16803 sensors. 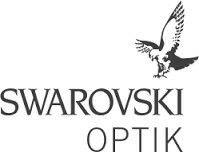 They are also a good choice for the latest Sony and back-thinned sensor. The E-Series red filter is a deep red filter about 60 nm wide, which excludes much of the light pollution from high pressure sodium street lamps. Other filter suppliers try to "force fit" their orange filter (designed for the interline KAI11000, KAI2000 sensors) for use with these full-frame sensors. Their orange filter (see below) is about twice as wide spectrally as our deep red filter. As a result, their orange filter tends to "wash out" HII regions in galaxies and detail in nebula. Their blue and green color weights are no longer balanced and as a result, the OIII color in planetary nebula is skewed strongly toward blue, rather than the correct teal color. 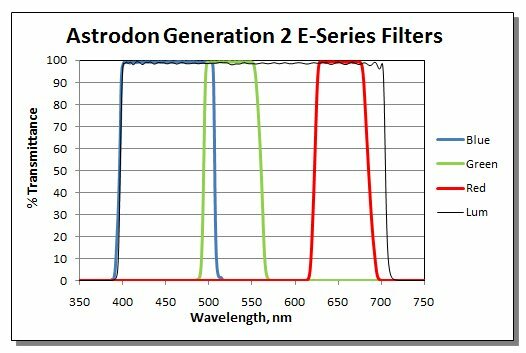 These are the reasons why Astrodon designed E- and I-Series filters for these different classes of cameras for optimum results.